An expert group of engineers, including Cornell Engineering Dean Lance Collins and Professor Tom O'Rourke, tour the Canarsie Tunnel. A benchwall lines the tunnel on the right. While speaking at an event in early December, Lance Collins, the Joseph Silbert Dean of Engineering, noticed his phone receiving an unusual number of messages. He continued his speech, not knowing until later that he was being contacted on behalf of New York Gov. Andrew Cuomo for a special project. Professor Tom O'Rourke, left, speaks with N.Y. Gov. Andrew Cuomo during a tour of the Canarsie Tunnel on Dec. 14. But thanks to Ivy League ingenuity – and engineering – there’s a good chance “L-pocalypse” won’t befall the Big Apple. What began with a few questions resulted in an entirely new plan to avert the shutdown, and perhaps a new model for how major infrastructure projects can be evaluated. 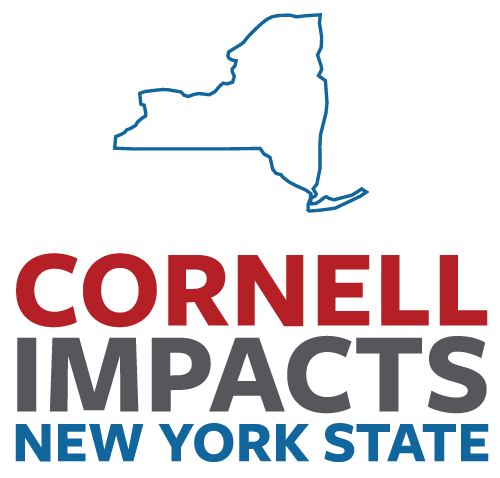 Collins and Cuomo were joined on a conference call by a number of officials and engineers, including Tom O’Rourke, the Thomas R. Briggs professor of civil and environment engineering with expertise in underground infrastructure and transportation systems. “Cuomo said he wanted a fresh set of eyes to look at the tunnel plan. He wanted us to see if we thought it was the best way forward or if we had any alternative ideas that might help keep the tunnel operational,” said Collins. The group discussed the work that needed to be done to the tunnel, parts of which were beginning to erode from the salt water that had flooded it six years earlier. Its concrete benchwall – a 2-foot-wide walkway stretching the length of the tunnel – was deteriorating in some areas, endangering the track and exposing the power and signal cables encased within. Soon after the call, Collins and O’Rourke received a detailed analysis of the tunnel and its proposed rehabilitation plan. After an in-depth review of the report, they were asked to join a midnight tour of the tunnel with Cuomo and engineering professors from Columbia University, including Mary Boyce, the dean of the Fu Foundation School of Engineering and Applied Science. With flashlights, hardhats and other protective gear, the team descended into the tunnel during the early morning hours of Dec. 14. They observed that while some areas of the benchwall remained intact, others had begun to crumble. In other areas, the benchwall had acted as a sponge, absorbing salt water that, in turn, was corroding the cables inside. Collins described the tour as informative and an exhilarating experience for the engineering team. He added that Cuomo was equally engaged. The team emerged later that night, galvanized and ready to dig deeper. In 2012, Hurricane Sandy filled the Canarsie Tunnel with salt water, from the Avenue D Fan Plant to the North 7th Street Fan Plant. The Cornell and Columbia engineers began examining different rehabilitation options. They worked collaboratively through winter break, mostly in New York City so they could exchange ideas and begin to piece together an alternative proposal to the existing rehabilitation plan. They toured the Hudson River Tunnel, consulted extensively with officials from the Metropolitan Transportation Authority (MTA) and Amtrak, peppered consultants with questions, and studied state-of-the-art rail tunnels in other big cities, including Hong Kong, London and Riyadh. The end result: a proposal to renovate the Canarsie Tunnel while keeping it operational, safe, on time and on budget. Night and weekend closures would be required, but only one of the tunnel’s two tracks would close at a time, allowing for continuous service. Instead of replacing miles of cables inside the benchwall, as the original plan had proposed, a racking system would suspend new cables on the side of the tunnel. This would allow the existing cables to continue powering the train while new cables are installed and jacketed in fireproof material. And instead of laboriously replacing 32,000 feet of benchwall, the plan proposes the wall remain where structurally stable and be fortified with fiber-reinforced polymer wrap where needed. The racking system has been used in the construction of modern subway tunnels and the fireproof material is used in the airline industry, but neither has been applied to a rehabilitation project of this kind, according to Collins, who said the fiber-reinforced polymer wrap is also a proven technology borrowed from other infrastructure projects. To monitor the Canarsie Tunnel’s interior, “smart” fiber-optic sensor cables would run along the remaining benchwall to detect small shifts or cracks. Like the other technologies, it has proven effective in projects outside of the U.S., and has even been tested in O’Rourke’s Cornell laboratory. O’Rourke said data gained from the fiber-optic cables would allow engineers to learn more about the Canarsie Tunnel’s condition than previously possible. “The fiber optics and other proposed sensors allow us to create a ‘smart’ tunnel that can detect very small levels of deformation and changes in structural integrity before there is serious loss of capacity in the system,” said O’Rourke, who added the plan also calls for a complementary high-resolution LiDAR system – a laser detection technology – to periodically map the surface of the tunnel and monitor it for deterioration. Collins said he is genuinely impressed with the original rehabilitation plan and emphasized that the new proposal could not have been conceived without the comprehensive work that had already been done. But he added that letting a group of outside experts re-examine the plan and “kick the tires” was an excellent idea that could be replicated in the future. “I see this as a case study of how major infrastructure projects could be done,” said Collins, who noted that academia is a good place to find experts with knowledge of emerging technology and outside-the-box thinking. An expert panel, including Columbia Engineering Dean Mary Boyce, left, and Cornell Engineering Dean Lance Collins, presents recommendations Jan. 3 for the Canarsie Tunnel rehabilitation project. O’Rourke pointed out that rehabilitating the tunnel with smart sensor technology provides an enormous opportunity for New York agencies and engineering firms to partner with universities and assume a leadership role in developing intelligent infrastructure. City officials hope renovations can begin sometime around April, as originally planned, but this time with the L train remaining in service. Watch highlights from the governor's Jan. 3 press conference.